A noted descendant of one of these traders having spent most of the winter in the settlement on Little River went to Pensacola, and there died in February 1793, the year when commenced in France those terrible times known as the Reign of Terror.” This was Alexander McGillivray, son of that Scotchman already named, who in 1745, so near as is now known, Meek says 1740, married Sehoy Marchand. 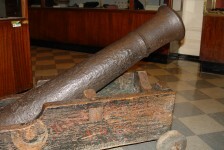 The father of this Creek maiden was Captain Marchand, a Frenchman who was at one time commandant at Ft. Toulouse and was killed there in 1722. The mother of Miss Marchand, the grandmother of Alexander, was a Muscogee, or Creek, of full blood, of the tribe of the Wind, the most powerful tribe of the Creek nation. Alexander and his sisters were, therefore, of Indian, French, and Scotch blood united. One of his distinguished nephews was William Weatherford, whose bloody deeds will be long remembered. Alexander was educated at Charleston, acquiring a knowledge of Greek, Latin, and of Polite Literature. He delighted in boyhood to read the histories of European nations. 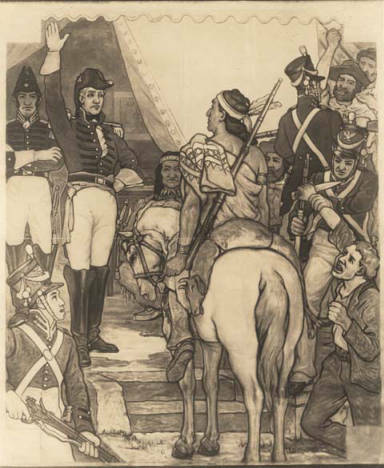 He returned to the Indian wilds, took control of the Creek nation, was an ally of the British during the Revolutionary War, receiving from them the rank and pay of a British colonel. After that war, in 1784, he went to Pensacola, and as Emperor of the Creeks and Seminoles, made a treaty with Spain. In 1790 he visited President Washington at New York, made a treaty there, was appointed Agent of the United States, and received the rank of Brigadier General, with twelve hundred dollars a year salary. Afterward a Spanish Monarch appointed him Superintendent General of the Creek nation, with a salary of two thousand dollars a year, adding to this in July 1792, fifteen hundred more. He was thus agent for Spain with a salary of thirty-five hundred dollars, for the United States with a salary of twelve hundred, a member of a wealthy commercial house, and Emperor, so called, of the Creeks and Seminoles. Pickett, who studied his character closely, considers him the greatest diplomatist, and possessing the most marked ability of any man born or reared on Alabama soil. He was buried in the grounds of William Panton, in Pensacola, with Masonic honors, and the Indians deeply lamented his death, feeling that they had truly lost a great chieftain. 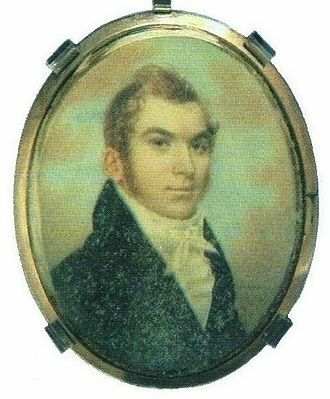 Benjamin Durant, of Huguenot descent, from South Carolina, had married the beautiful and talented Sophia McGillivray, a sister of Alexander McGillivray, and had cultivated Durant’s Bend on the Alabama as early as 1786; and Mrs. Sophia Durant appears to have been living on Little River in 1790, when, by her authority and resolution, she saved the Tensaw settlements from a threatened massacre by the Creeks. 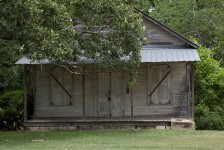 Her son, Lachlan Durant, was in 1851 a well-known resident of Baldwin county. Lachlan McGillivray, the father of Mrs. Durant, who had married Sehoy Marchand; who as a Scotch boy of sixteen, had left a wealthy home in Scotland to see the wonders of American wilds ; who had landed in Carolina with a single shilling in his pocket; who had joined the Indian traders, and on the Chattahoochie, about 1735, made his first trade, exchanging a jack-knife for some deer-skins; who saw for the first time the young Sehoy, when she was sixteen years of age, “cheerful in countenance, bewitching in looks, and graceful in form;” spent as Indian trader and Georgia royalist nearly half a century in these wilds of America, which had so excited the imagination of his youth ; then leaving his Indian children, his plantations, and his colored servants, he embarked with the British when they left Savannah, probably in 1782, and sailed for his native land. Before embarking he had “scraped together a vast amount of money and movable effects.” He was still living at Dunmaglass, Scotland, in 1794, when a letter was sent to him announcing the death of his son Alexander, and asking his care for a grandson and two granddaughters. Still another of these white traders may be here named, whose noted son became closely connected with scenes of strife and bloodshed, as the white settlements advanced. This trader was Charles Weatherford, also a Scotchman, who married a half-sister of General McGillivray, the daughter of a chief, and of pure Indian blood, who in 1778 had been married to Colonel Tait, a British officer at Fort Toulouse. 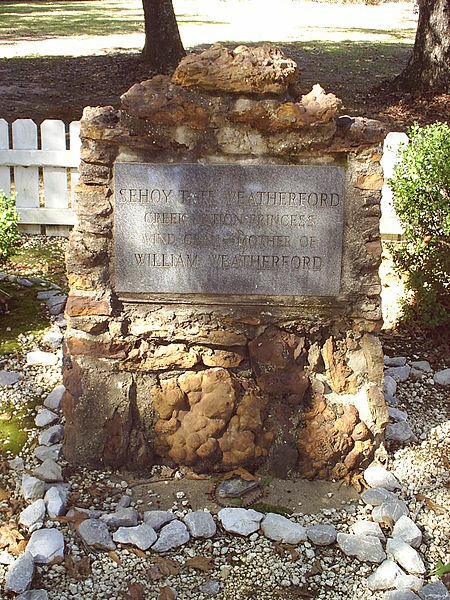 Head stone of Creek Nation Princess, Sehoy III Tate Weatherford. The principal residence of General McGillivray was near the mouth of the Coosa, but his brothers-in-law had their plantations and various homes along the Alabama river, as far as to its union with the Tombeckbee. At one of these residences on the east bank was born, about 1780, William Weatherford, whom the settlers in after years had cause to remember. Other white traders had more or less influence upon the surroundings of Clarke. 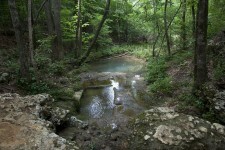 Other noted frontier or border men, men of bad renown some of them, were along the Alabama or its tributaries.